The Jacoby Wine Server seamlessly blends elegance and tradition. Its plain leaded glass doors paired with the 1 3/8-inch tongue and groove plank top is proof of this. Place your wine glasses and decanter on the adjustable shelves. Then, store your wine opener, barware or even table linens in the the three solid wood drawers. Finally, consider pairing this with the Alberta Pedestal Table and you will be ready to entertain all of your family and friends. The craftsmanship that goes into making this Jacoby Wine Server is impeccable. You can see this in the dowel and wedge construction. Clearly, they take their time to ensure every detail is complete. They choose only the finest hardwoods they can find and don’t even begin construction on it until they have your order. This allows us to fully customize it to meet your needs. For a quote, click on the “Customize This Product” button. 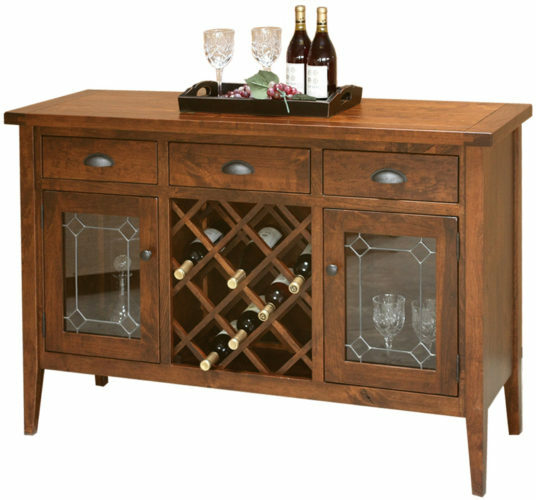 Then, choose from the wide selection of options available for this Jacoby Wine Server. Visit us at Brandenberry Furniture in Shipshewana, Indiana. 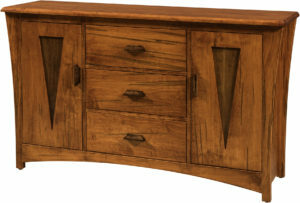 Then, you can see the wide selection of our quality crafted solid wood servers in person. 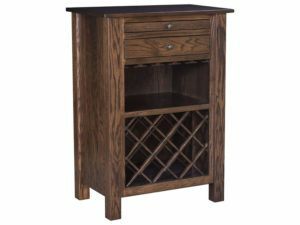 Additionally, you can call or e-mail us with any questions you may have, for help in customizing this Jacoby Wine Server to meet your needs or for a complimentary price quote. We look forward to assisting you in anyway we can.